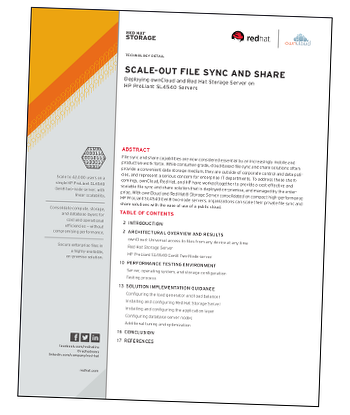 Enterprise mobility, collaboration, and the need for anytime, anywhere access to files is driving the need for secure file sync and share capabilities. Cloud-based solutions can be compelling and users have been drawn to these options when solutions are not available from corporate IT departments. Unfortunately, this poses a number of security risks. The unique combination of ownCloud with Red Hat Storage Server on HP ProLiant SL4540 servers provides a scalable high performance solution that lets users collaborate effectively while allowing IT staff to stay in control of the data at all times.